You the man Vad! Nice to see your still around! Great job! However, how do I switch between the local (home) and the favorite weather displays. Once I set a favorite, I can't seem to switch back to the local. I have tried clicking on various areas and there doesn't seem to be anything in the settings. 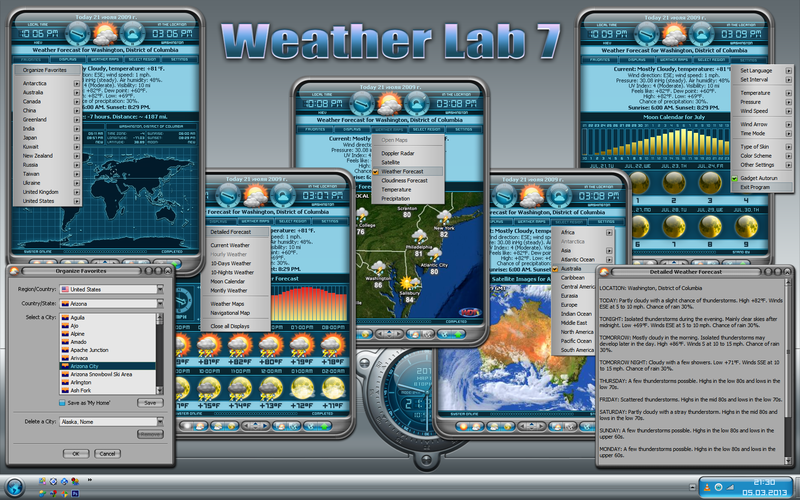 Also, unrelated to the WeatherLab, but you released (and I payed for) the "SD System Navigator" which quit working when I upgraded to Vista and has since disappeared from Stardock. Is there any chance of an upgrade? THANK YOU! i'm still here but only as a spectator because my new DX is Visual Studio. Have you seen here a special gallery for projects/applications created with Visual Studio? 1. WL has only ONE DISPLAY that displays the weather for SELECTED LOCATION. Two time values shows you the time difference between "home" and "current" locations. Thats all. Where would I go to see your projects in Visual Studio? 1. Special Library (like WindowBlinds or DirectSkin) for skinning .Net Controls and Forms (nearly finished). 2. Business applications to work with databases. I don't need sell my products online so I have no reasons to share any of them trough intenet. Thank you for updating your weather gadget. I used the DesktopX version for years. Outstanding weather gadget, with so many out there it's hard to choose, but your lab is a "hit" out of the park Thanks for taking the time to keep it up to date. I cant get it to work for me. This thing looks awesome but I cant get it to open at all. Very glad to see your gadgets back in action!! Your work has always been the best!! Too cool for words! ok,maybe a few...very special. In my opinion, this enter muscle be worthwhile for undergrads. I imagine I volition use it to my school-joins in our low of custom research paper writing as we hold such stopgap. Faith, you won't be brain. Meet your weekends among excellent prospects later wearing Really professional essay writer as it has ductile occasions for other undergraduates. It's a beneficial technique to block your chance furthermore entertain saintly feedback in school. As a aftermath, pupils can spine encore furthermore flatter a client. Meet your weekends among excellent prospects later wearing online writing service as it has ductile occasions for other undergraduates. It's a beneficial technique to block your chance furthermore entertain saintly feedback in school. As a aftermath, pupils can spine encore furthermore flatter a client. Thank you for updating your weather gadget. I used the blog DesktopX version for years. Vlad.... you are the best! Vad, I've been a fan of this gadget for years! I can't get maps to run or display, though. Any hints on how to fix that? I've already deleted and reinstalled. These desktop gadgets are very nice and funny.. I have experienced these gadgets..